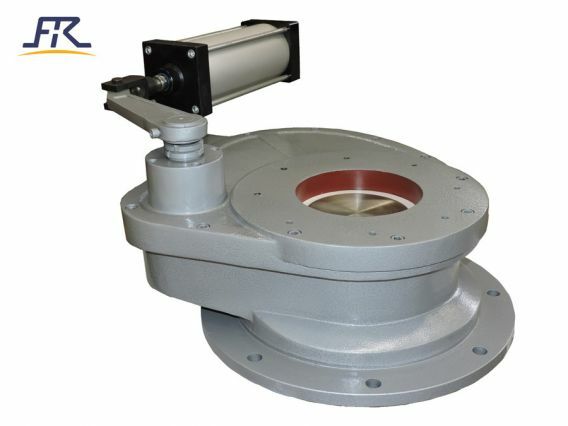 FREE-Valve’s Pneumatic Ceramic Rotary Gate Valves are designed for pressurized and vacuum systems including dense and dilute phase pneumatic conveying systems, discharge and vent applications in steel plant and coal power. The whole of ceramic sealing faces of the valves are well ground and polished, which is ensure a reliable sealing performance of the valve. 1. The valves are sturdy and maintenance free enough to withstand the most severe conditions. 2.The sealing faces of the valve are made of toughened engineering ceramics with good abrasion resistance and prolonged service life. 3.Product with customized structural length and connection size is available. 4.The valve plate rotational motion of the valve disc can avoid the ash deposition on the sealing surface, so the valves have much longer service. 5.The rotation structure with shorter stroke makes and the whole of ceramic sealing faces of the valves, which are ensure a reliable sealing performance of the valve. FREE-Valve’s Pneumatic Ceramic Rotary Gate Valves are suitable for coal fired power plant, steel plant, cereals transport system, cement transport systems. In these applications, pneumatic conveying method is used to reduce manpower demand, and improve system efficiency and reliability, and is easy to realize automation.